Creating events is one of the business resolutions I set out for 2019. I knew that when the right opportunity would come along I’d be excited to bring it to life. event in Leeds, why we are doing it and how you can join us! In December last year, Richard Ashby, Founder of Dotkumo Ltd, reached out to me on LinkedIn. Richard came across one of our LinkedIn posts and saw that our businesses share a lot in common. I was immediately interested to meet him when he mentioned his ‘background in university communications and research promotion, video and motion design projects for researchers’. We set a meeting to get to know each other in February this year. In our first meeting, I was impressed by Richard’s portfolio and range of collaborations with academics. We were speaking the same language and I was excited to find a kindred soul that understood the academic world so well and was motivated by the same mission to make knowledge accessible. Since our services are very compatible, we agreed to stay open to future collaborations. Towards the end of the meeting, Richard casually mentioned the government report that had just been published titled Disinformation and ‘fake news’: Final Report. I couldn’t believe it. The preliminary report on this topic that was published last year was something to which I dedicated a significant amount of time and interest. On that day, I was equally intrigued about the launch of the final report and was keen to read its findings. In my experience, it’s rare to come across people who say ‘Hey, have you read the latest 90-page report on this niche topic?’ Which is why when I met Richard I thought it would be good to turn this shared mutual interest into … something! Noticing how enthusiastic we both were about the report, and in turn, combating fake news and disinformation, and remembering my resolution for 2019, I asked Richard if he’d be interested in co-creating an event. His response was instantly positive and we set the wheels in motion for a new meeting to explore the idea. 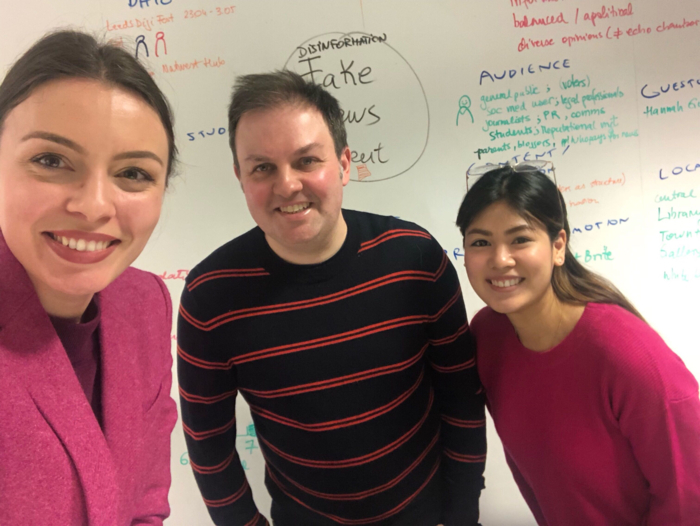 We met a week later at the end of February and had a good ol’ whiteboard brain dump meeting, joined also by Isabel, our Business Development Assistant (and Event Extraordinaire). In this initial meeting, we discussed our ideas for what the event could be. We threw ideas at the board and slowly narrowed down content from there. This was an effective method that allowed us to get a mental picture of the event and the various building blocks needed to make it happen. During this ideation process, we spent a lot of time identifying the type of people we aimed to reach through this event. 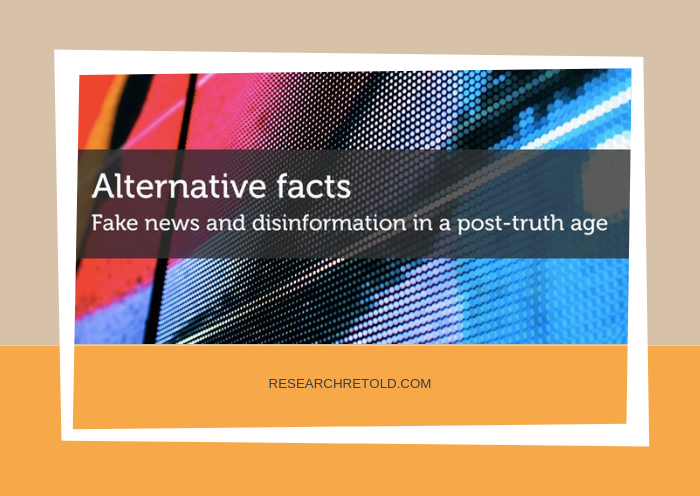 In doing so, we put a lot of thought into the social media behaviours of our target audience, the different touchpoints where fake news could be part of their online habits, and how these different people would most likely respond in these situations. This served as the starting point for developing the content for the event. To boost our chances of getting a larger crowd, we decided to host the event during the Leeds Digital Festival. 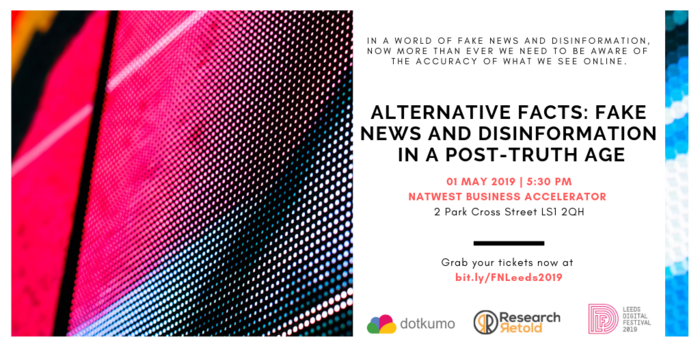 The aim of our event is to give our audience a general definition of the concept of ‘fake news’, the different types as well as the ways in which it manifests itself online. For the event, we will use the government report as the basis of our content and aim to make the information as accessible and digestible as possible. The format of the event will be interactive and will include practical tips, advice and key actionable insights on spotting fake content online. This event will definitely not be a lecture, rather a conversation and open conversation about a contemporary phenomenon that permeates our lives everyday. After weeks of planning, we are very excited to share that the Alternative Facts event, created by Research Retold and Dotkumo, is now featured on the Leeds Digital Festival’s website! The event will take place on May 1st, at 5:30 PM at the Research Retold HQ in the Natwest Business Accelerator, at 2 Park Cross Street, Leeds, LS1 2QH. Find us on Twitter at #fakenewsleeds. Tickets are free. Register now at bit.ly/FNLeeds2019. To everyone who already bought a ticket, we look forward to meeting you!